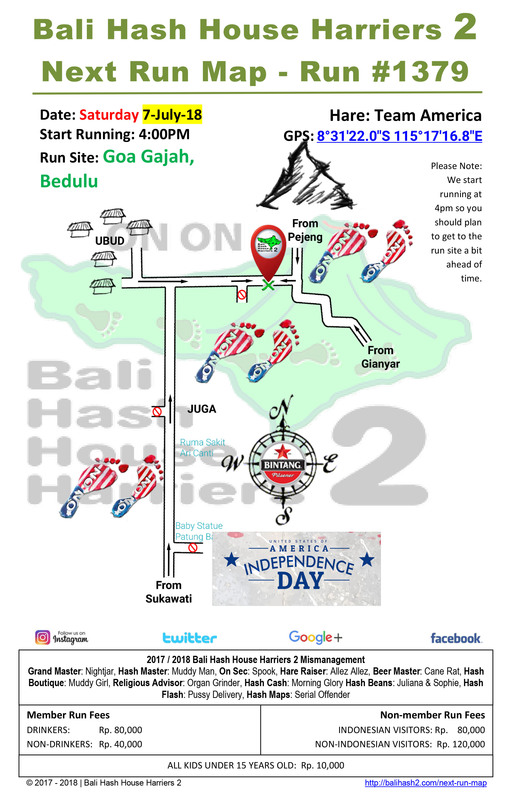 Come join Team America and Bali Hash House Harriers 2 for the annual United States of America Independence Day run at Goa Gajah. We have a full on celebration lined up with 2 run trails being set around the beautiful Balinese country side starting from the parking lot at the ancient temple site of sacred Elephant Caves. From there we will set off and find a split on the trail for the 6 km short trail and the 10km long trail. We will be celebrating Independence Day at the parking lot with American style food, free flow beer and soft drinks and music. Upon the conclusion of trail (either by returning to the starting bar or by reaching their destination), hashers are generally given a few minutes break in order to pour themselves a beer, use the restroom, or anything else that they might need to finish before “Circle” is called by the attending Hash Master. The Hash Master then commences with calling in the Hares for a down down, followed by welcoming back of returning hashers and the anointing of Virgin hash runners to Bali Hash House Harriers 2. Once the formal business is concluded, the RA or Religious Advisor begins the calling of accusations, a calling out of hashers for either ridicule or for praise. When a hasher has been accused, they then come into the middle of the circle and before the entire hash, the accusation is stated, and a song is sung. Upon conclusion of the song, the hasher must then finish their beer or beverage of choice, also referred to as a Down Down. If a hasher does not want to finish their or beverage of choice (for whatever reason), they are permitted to pour the remainder of said or beverage of choice on their head. It should be noted that there is no defense for accusations, and anyone who is called out for a down-down must come into the circle unless the RA states otherwise. Good Friends, Good Trail, Good Circle …. Come Join Us Bali Hash House Harriers 2 …. 2 ….. 2!